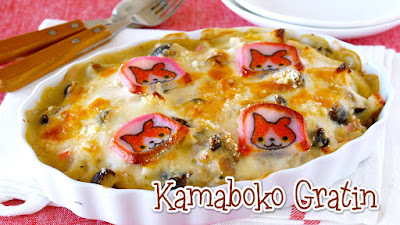 The texture of Shimeji and Kamaboko is just like Macaroni!!! 1. Remove the skin from the chicken, cut into chunks, and season with salt and pepper. Slice the onion. Break Shimeji mushrooms into pieces. Thinly slice Kamaboko. 2. Heat butter in a pot then stir-fry the chicken, onions, and Shimeji until cooked. 4. Add water, soy milk, and consomme cube, then simmer until the sauce thickens. 5. Add Kamaboko and season with salt and pepper. 6. Transfer to a pie dish, sprinkle with pizza cheese and parmesan cheese. 7. Bake in the oven at 250C (482F) / gas oven to 230C (446F) / or you can use a toaster oven, for about 10 minutes, just until golden brown on top.